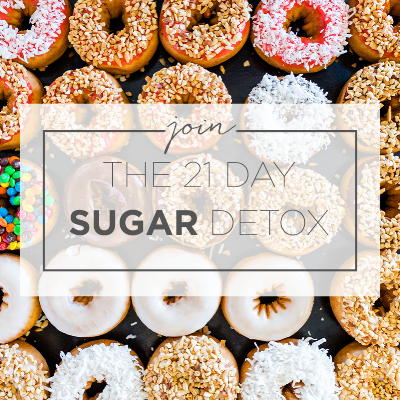 Reserve Your Spot for the Online 21 Day Sugar Detox Series Here! The 21DSD online series consists of three weekly LIVE and INTERACTIVE conference videos for participants. This will include pre-detox planning, professional nutrition support, recommendations for meal planning and shopping, customizable recipes, and optional supplement/herb recommendations. Take the guess work out of doing a detox by yourself and have more FUN in an engaging and supportive group atmosphere. For more information about the 21DSD click here. Join the newsletter for more information. Remember, if you join with a friend, family, or loved one you save $10! IMPORTANT: Please be sure to purchase the “21-Day Sugar Detox Daily Guide” by Diane SanFilippo before the class series starts!! Can’t wait until the next online series? Schedule personalized 1-on-1 coaching instead. Click here to schedule your free 15 minute consultation!